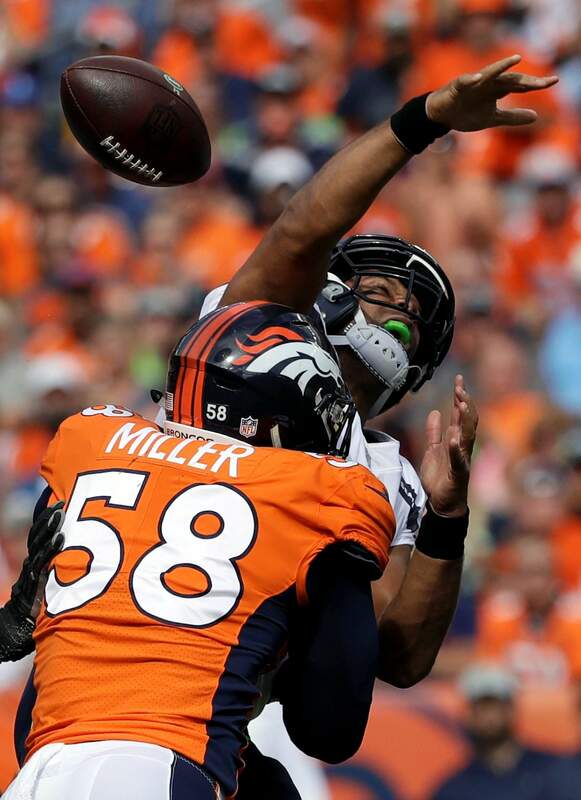 Seattle Seahawks quarterback Russell Wilson, top, loses the ball as he is hit by Denver Broncos linebacker Von Miller (58) during the first half of last Sunday’s game in Denver. Von Miller might be the only one at Broncos headquarters lamenting Khalil Mack’s startling trade from the Oakland Raiders to the Chicago Bears. ENGLEWOOD – Von Miller has received plenty of instruction over the years from DeMarcus Ware, his idol-turned-mentor in Denver when they won a Super Bowl together and now his tutor as a part-time pass-rushing consultant for the Broncos. Ware is going to compete on “Dancing with the Stars” this fall. The Broncos juggled their practice squad, re-signing WR/KR Isaiah McKenzie and releasing fellow 2017 draft pick Carlos Henderson, a third-round WR who skipped training camp because of undisclosed personal reasons.